Category Archives: Yeah, And We Have A Right Not To Watch NFL Football Too! So National Football League players have a right to protest during the National Anthem and the honoring of the American flag? It is true that they have that right, AND it is also true, that we football fans have a right to turn off their NFL games. My great-great-great-great-great grandfather fought and died in the Revolutionary War. I consider the NFL protests a desecration of his sacrifice. I am a very patriotic American and I do not appreciate these rich NFL boys being careless with our hero’s great sacrifices, whether it is intentional or not. NFL players can say that they don’t mean it that way, but it still has a bad feeling for me. As much as I used to love NFL football, in no way do I need NFL football to live a good life. I can do without it just fine, thank-you-very-much. They say, that their protests are not about the National Anthem or about the military. Hmmmm. 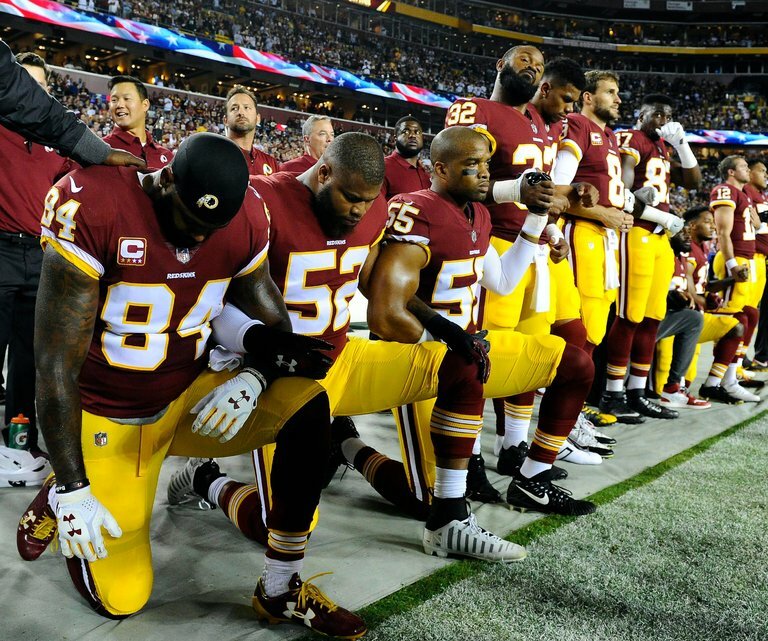 While the National Anthem is playing is the exact time these rich-boys are showing contempt. That is the exact time they are going against the American tradition of showing respect by standing and facing the flag with right hand over heart. Kaepernick, who started the protests, has not been re-signed by any NFL team. This is the natural consequence of his actions. He has become a liability to the owners who make billions off of pro-football, and you can’t blame them. Now get this. That same Kaepernick turns around and files a grievance against the same NFL. He alleges that the owners colluded to not give him a job. What the hacklejaw? Kaepernick and his cohorts seem to think they can force the NFL to accommodate their protests AND they seem to think they can force NFL owners to still provide them a job. Do they also think they can force fans to keep watching them play? Do they think they can sue America for racism, and force America to continue to love NFL football? Of course the players can protest if they wish; however, being the patriotic man that I am; I will not play along with it. If they want any support from me concerning their grievance, then they will need to find a different venue of protest , and they will need to stop trying to force us to do their will. Filed under Yeah, And We Have A Right Not To Watch NFL Football Too!